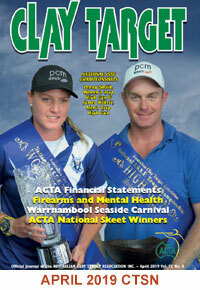 Australia’s clay target shooters now officially have a headquarters the envy of their peers around the world. The new function centre – The Range – was officially opened at the Australian Clay Target Association’s National Grounds by Wes Fang, MLC in October 2018. Clay Target Shooting is a sport that can be enjoyed by the whole family as a recreation at a local gun club, or at a competition level from registered club events to regional, state, national and international competitions. These include World Championships, Commonwealth and Olympic Games. The Australian Clay Target Association is responsible for administering, promoting and developing the sport of Clay Target Shooting. This site provides clubs, members and visitors with information and news regarding our sport. We provide information on events for local, state, national & international competitions. You'll find many areas of interest including Coaching, Referees, Membership, Hall of Fame, the Clay Target Shooting News magazine & more. The 2018 ACTA Annual Report has been released. Please click here to download a copy. To be held at TBC, Monday 13th to Saturday 18th January 2020. Training Day 12th January 2020. To be held at National Ground Wagga Wagga, Monday 23 March to Sunday 29th March 2020. To be held at the National Grounds, Wagga Wagga NSW, Sunday 19th to Saturday 25th May 2019. To be held at West Australian Gun club. Jules Steiner Memorial Dr, Beechboro. Saturday 24th to Sunday 25th August 2019.